It is a pretty clever idea. 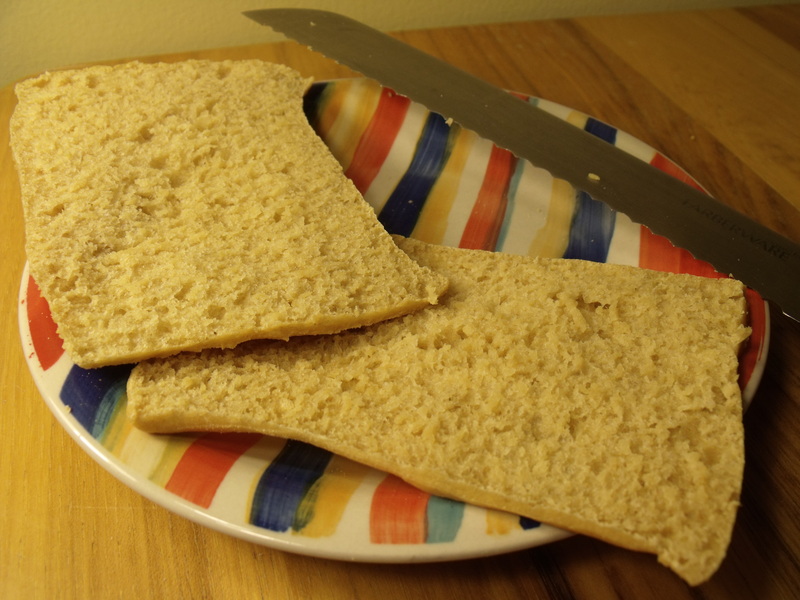 Thin down the bread so you get less calories, but can still eat a stuffed sandwich and have that “bready craving” satisfied. Thing is, the creators of this brilliant idea thought it was such a great idea that they could market and sell said bread product for at least triple the cost of a normal loaf of bread. Like i’m going to pay four bucks for eight tiny “thins.” Plus, have you tried these things? They don’t really taste all that great! So, I decided that it couldn’t be all to difficult to make my own. Tasty and economical! Hooray! Below is actually my go-to basic bread recipe. This is a recipe my mom found online somewhere many many years ago during my childhood and that I grew up eating. It is so easy that I’m pretty sure my 5 year old sister can do it! 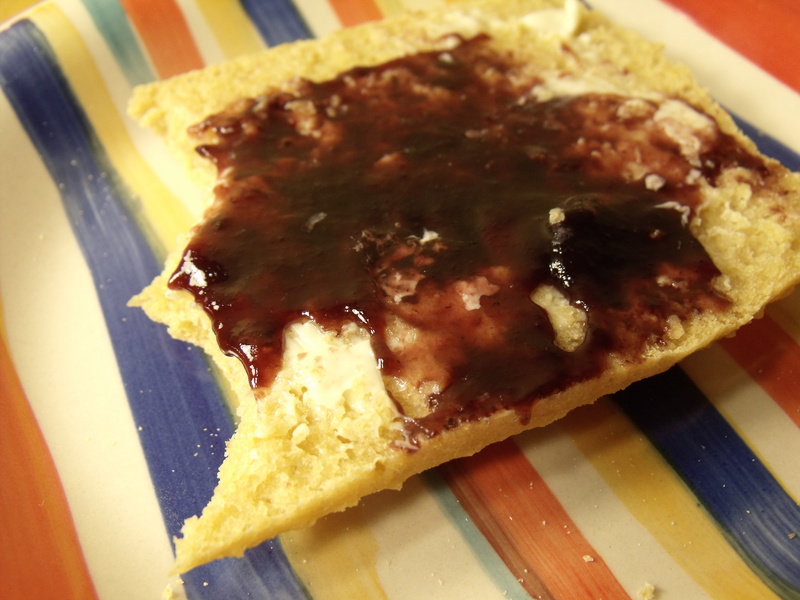 I’ve included how I changed it for the sandwich thins. Pour warm water into a small bowl and add the yeast, but DO NOT STIR. Set aside. On a lightly floured cutting board or countertop, divide the dough into half. (The recipe actually calls for no kneading.) 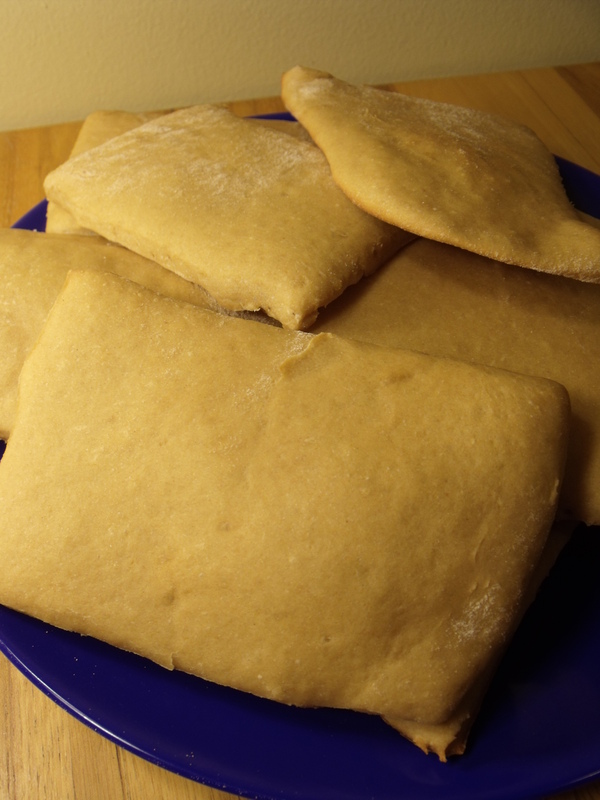 Flatten each half into roughly an oval/rounded rectangular shape, about 1/2- to 3/4-inch thickness; then roll the dough lengthwise and place on an ungreased, but very BIG, cookie sheet. (or use two cookie sheets, one for each half of the dough.) 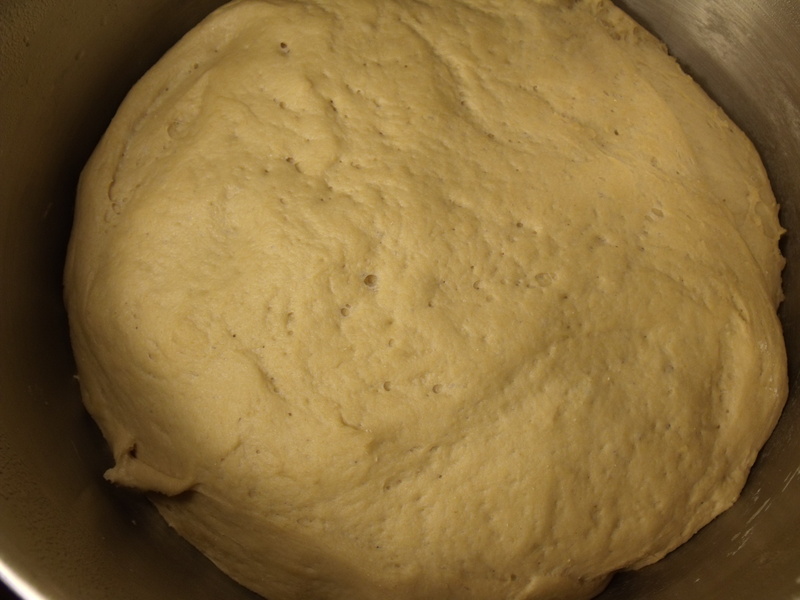 Cover the dough with a moist towel and set aside to rise again for another 45 minutes (or longer). 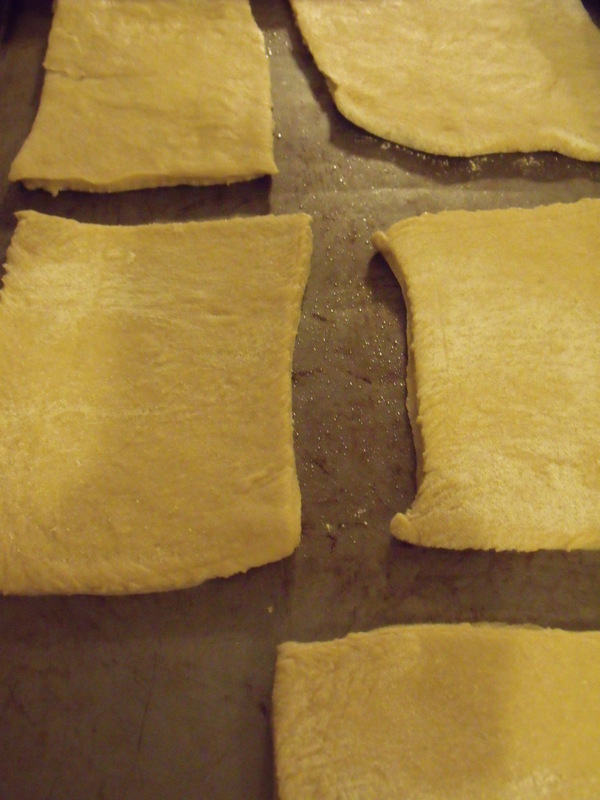 At this point I actually rolled the dough out to a little less than a 1/2 inch thickness and cut it into squares. (If you divide this recipe into 48 squares, they should be approximately 150 calories each.) Then I placed them on a baking sheet and covered with a wet towel to let them rise. 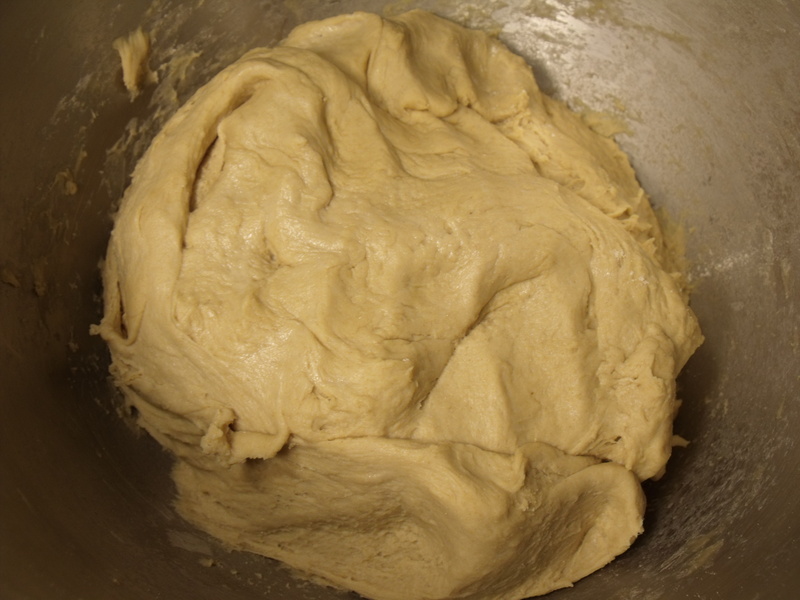 After the dough has risen the second time, preheat the oven to 375 and bake for 23 minutes (if you are making the thins – they only took about 1o minutes). I found it easier to use a serrated knife to cut them when they are still warm – but when they are cold it works too! A success! So much cheaper and waaaay tastier – I had to dig in right away! P.S. I think next time I am going to try and find a way to cut them more uniformly – so I’ll let you know how that goes.